Orange you glad to have me back? Hey, everyone! It’s almost like I open a whole new graphics shop every two years, but it peels great to be back! No, I'm not done with the username puns. I know. It's a tragedy, but they always told me growing up was optional. Also, under the cut you will find samples of my work. GO ME! READ THIS FIRST. PLEASE. I'M BEGGING YOU. ♕ All SS rules and Madame Malkins rules are rules in this shop. ♕ High quality images make for a happier Laurange! Also, please post any pictures under a spoiler tag. ♕ No peel-giarism. Always credit either me or the shop. There’s a dandy space in your profile for that, too! ♕ Please do check this post before you request to check for open slots. I’ll be taking two to three requests at a time. ♕ I reserve the right to deny a request, especially if it is one I don't think I'll have time for. ♕ Leave me room to be creative! If you know exactly how your graphic should look, I'll never be able to do your vision justice. You’ll find the request form – CRAP I LOST IT - *shuffles through papers frantically* – oh, nevermind, it's here. Originally Posted by Ask and ye shall recitrus. I mean receive. ♕ What sort of request is this? Do you want an avatar? Profile picture? Signature? Banner? A whole set? TELL ME! 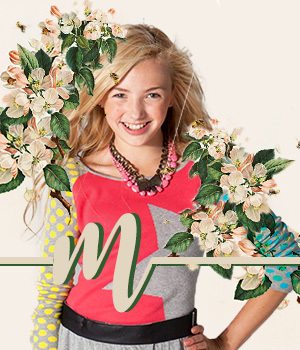 ♕ Which pictures do you want in here? High quality pictures would be great. But leaving the name of the model/FC works just as well. Actually, I prefer it when you do. Be warned, though, I get distracted when I get to stare at pretty faces. Which may cause your graphics to take longer. ♕ Text? Do you want any? None? ♕ Anything else? Do you need options to choose from? Any colouring preferences? Fonts you prefer? This is where you tell me! SORRY, there is no space in the queue! !!!!!!!!! LAUREEEEEEN! WELCOME BACK TO MM’S! It’s so great to have you here again with a new shop! And your work is absolutely gorgeous holy crap *___* Keep up the amazing work! Could I be first requester? pic: anything from here or you can find some other pics of non-glasses Isaac Hempstead Wright. Anything else: .... nah, just do your magic! I’m so happy that you’re back. You make such amazing graphics. I love them. ♕ How about dimensions? What size do you want these? 450x150 for signature; site limits for the others work fine! 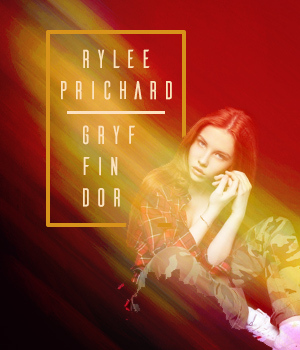 Last edited by MuggleDinosaur; 04-05-2018 at 08:39 PM. I love the fruity puns. I would come up with one myself, but we both know that I'm cheesy enough without them. So, without future ado, here is my request. ♕ Which pictures do you want in here? Ashley Benson's the model. Anything that's looks kinda professional would work. I can dig some up later for you, if you'd like. ♕ Text? 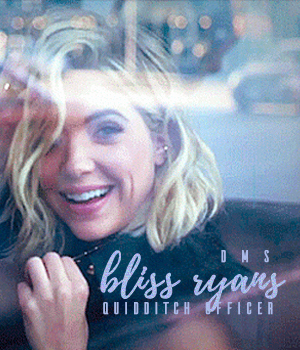 "Bliss Ryans" for sure, and then any combination of "Department of Magical Games and Sports"/"Quidditch Officer"
♕ Anything else? I love you, oh, so much. KITAAAAAAAAAA!! 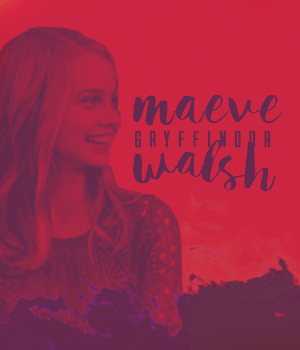 *CLINGS* Thank you, lovely! I do try to please the masses. HEYYO, RAVEN. Looks like you succeeded! Your graphics are down below. I was going for a sorta comic-book aesthetic, but if you don't like it, I provided a regular type? And if you still don't like it, let me know. Thank you, angel. I'm so glad to be back, though I'm slow as ever with graphics and replies. But, y'know, baby steps? I'll see what I can do. You've been queued. HI BESTIE. Thanks, but I recycled most of them from my last shop. :xD: I've queued you, and I'm SO excited! Also, I love you too. There actually was an open spot, since I had four to start the shop out, but it's still open! ♕ Let me know when you've picked this up. ♕ Or if you need anything changed. ♕ No hotlinking! Please upload to your own image-hosting account. ♕ No peel-giarism! Always credit either me or the shop. That looks goood!! I know finding his non-glasses pic is such a pain but I love this except... the size I asked is actually 450x165, if you don't mind to change it a liiiiitle bit? otherwise it looks good. Thank you! What sort of request is this? Siggie Please! ♕ Which pictures do you want in here? Her model is Jade Weber. As she's a firstie if photos used could make her look that age or nearish that would be great <3 (if you do need images let me know! ♕ Text? Do you want any? "Gabriella Diggory. First Year"
♕ Anything else? Do you need options to choose from? Uhh. Im gooood for anything! Soo surprise me! Im excitedd to see them!!!! Awww ... so red ........ In case there's any doubt what house These are cute!! I...*think* there's an open spot? ♕ What sort of request is this? Set, please! ♕ How about dimensions? 450x156 or so for the siggy, and no prefs for the others. ♕ Anything else? Umm...no prefs? I love your stuff, and THANK YOU! I've fixed them! You'll find them below. Thank you, sweetie! You've been queued. Glad you like them. I was struggling a bit with the photo selection. Indeed there is! You've been queued! I always love fruit puns!! I love them! I love that there's an avatar w/ Blue in it and the extra Isobel signature!!!! Of course, lovely! I was so so so happy to make them. ♕ Anything else? Nope! Do what you want with it! Last edited by Kolyander; 04-29-2018 at 01:07 PM. NOTE: Due to work being a thing, and it being rush season, I'm afraid that I won't be able to get any graphics done until the end of the week. If you're in a hurry, please nudge me and I'll see what can be done, but otherwise, sit tight and I'll try get them in this weekend. Thanks for being patient with me, guys! No problem! I've got a set I recently put in, so I'm in no major hurry! Thank you so much for being patient with me. Edit: When I went it put the PP in it says that the file is to big? Last edited by Kolyander; 05-14-2018 at 04:48 PM.